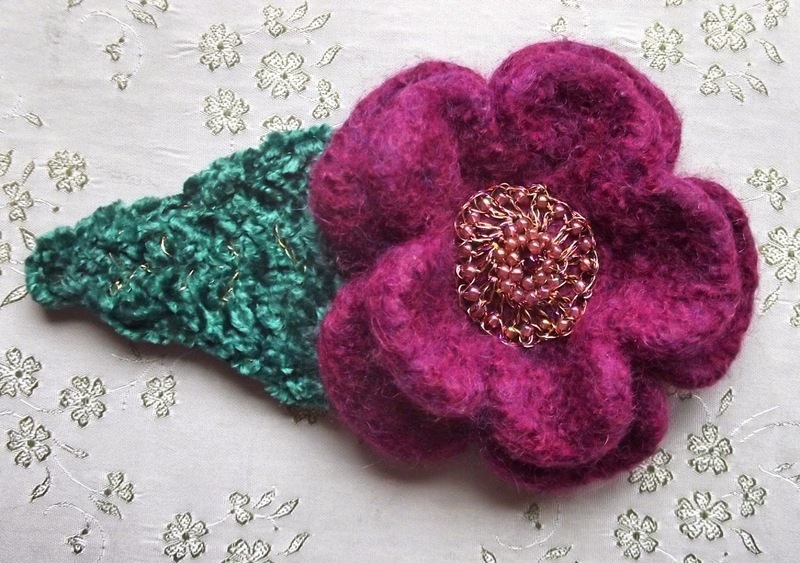 The Cozy Winter Garden - Crocheted Felted Flowers. So far, I've been spending the New Year playing catch-up, and I am beginning to feel like maybe by 2016, I'll be on top of things! Although honestly, probably not. But first things first, as they say, and today I've set aside a bit of time to post here. It's cold and snowy here in Michigan. Not surprised, are you? What else would you expect in Michigan in the dead of winter. But despite growing up here and choosing to remain in the Water, Winter Wonderland (the official Michigan slogan when I was a child), my head is filled with vibrant colors and summer flowers. 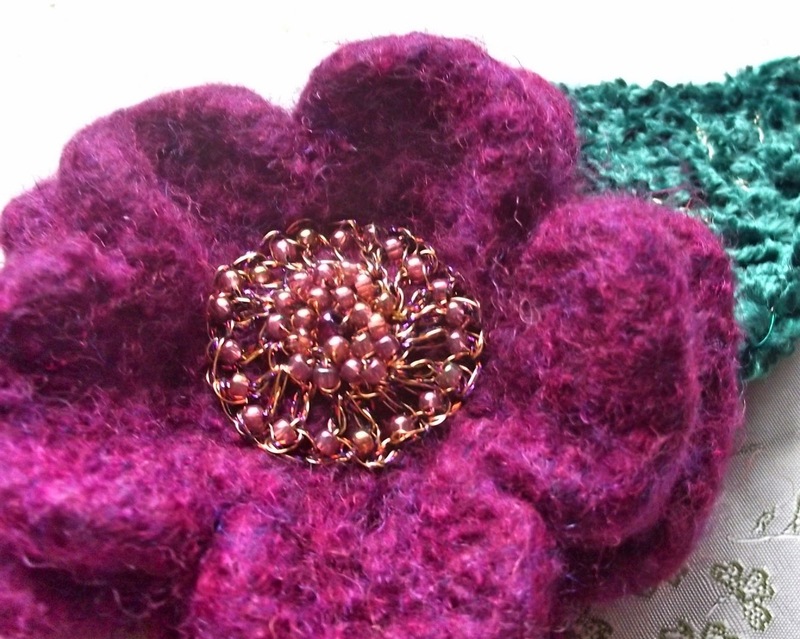 Maybe that is why I have been so drawn to creating crocheted, felted flower brooches this winter. It's my way of planting a garden in winter -- a warm and cozy garden. 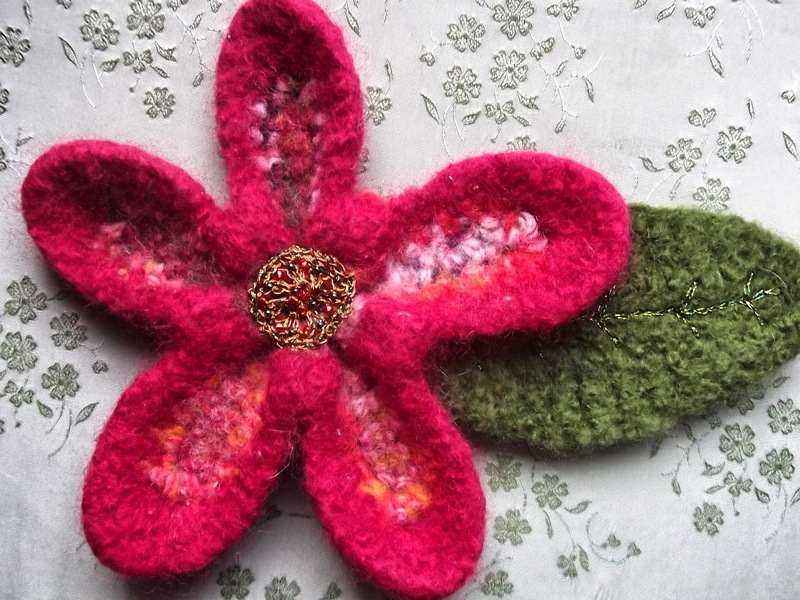 I hope that browsing through my woolly blossoms brings you pleasant thoughts as you while away your winter hours -- wherever you are. 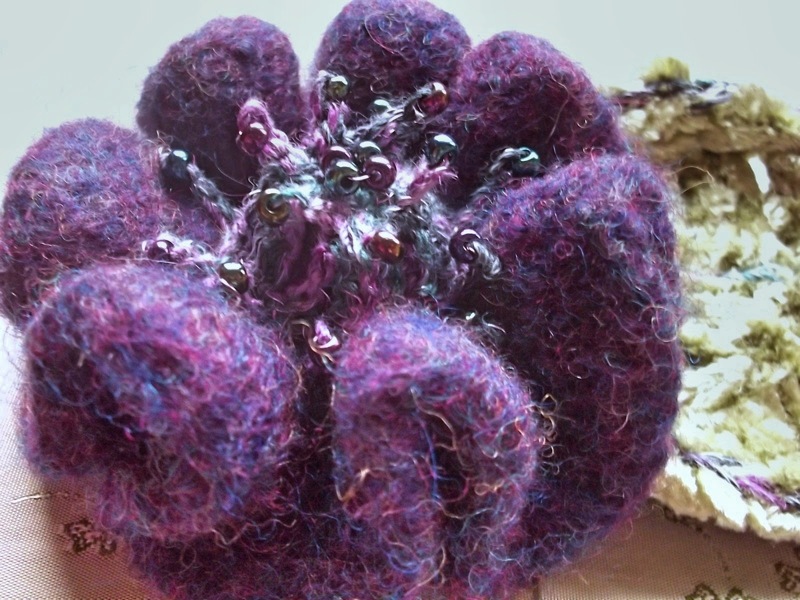 The center of this purple posie was crocheted using a combination of wire and thread, to give it a three dimensional structure. 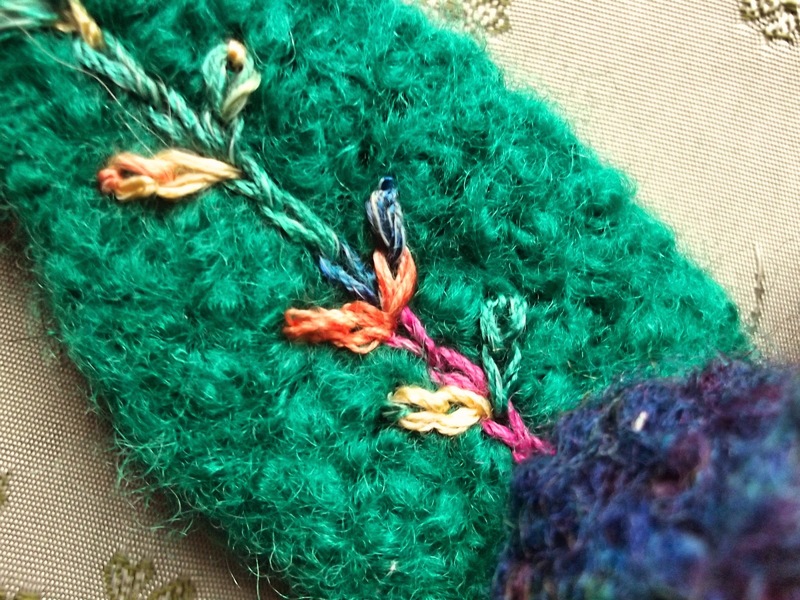 The leaf was also crocheted using yarn and wire together, to give it body, and the details on the leaf were embroidered using the same thread that was used for the center of the flower. 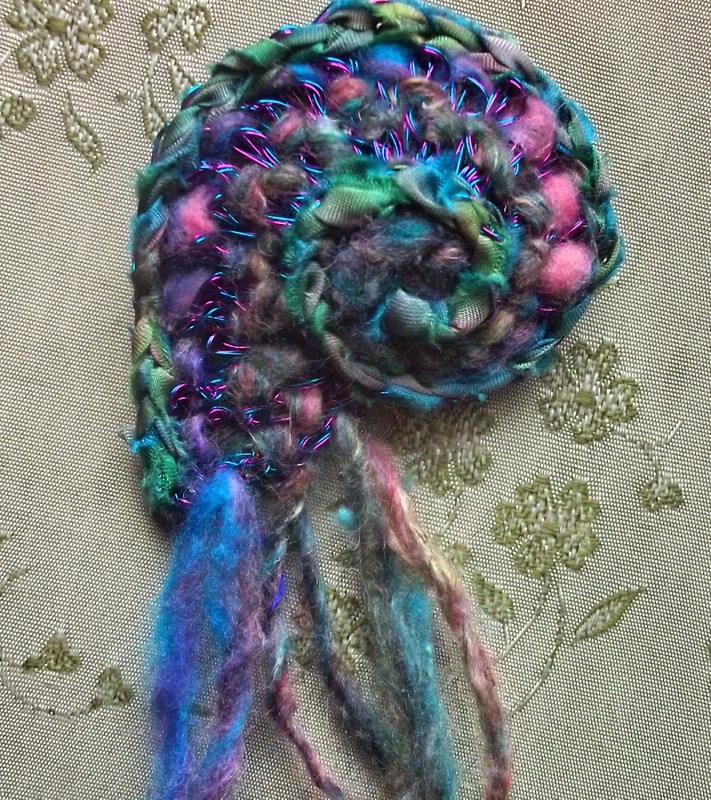 I have to say I LOVE the thread that I used in this flower and the blue/multi-color flower below. Even the name is fabulous! It's called Argh! and it's a cotton/rayon blend. 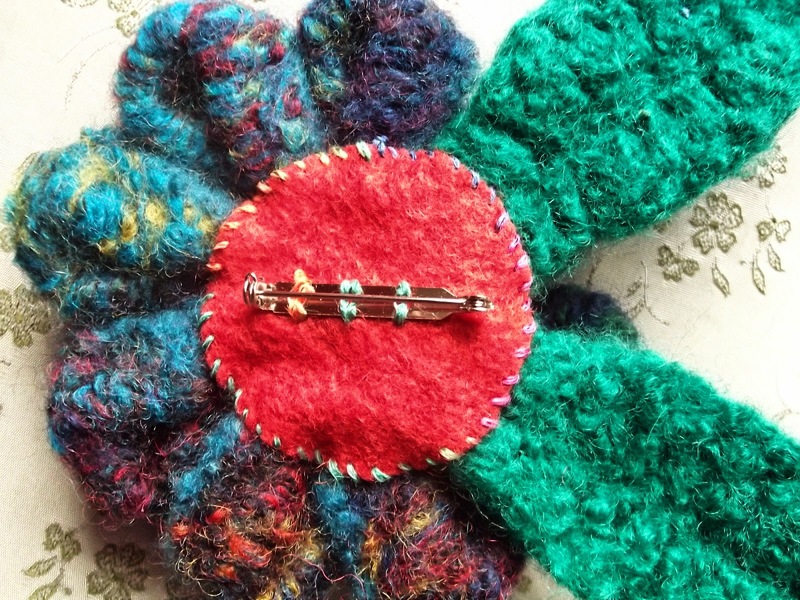 It comes in a bunch of great variegated color combinations, and I have been able to use it for both crochet and embroidery in a variety of projects. As far as I have been able to determine, the only place to buy it is online, through The Beadwrangler. 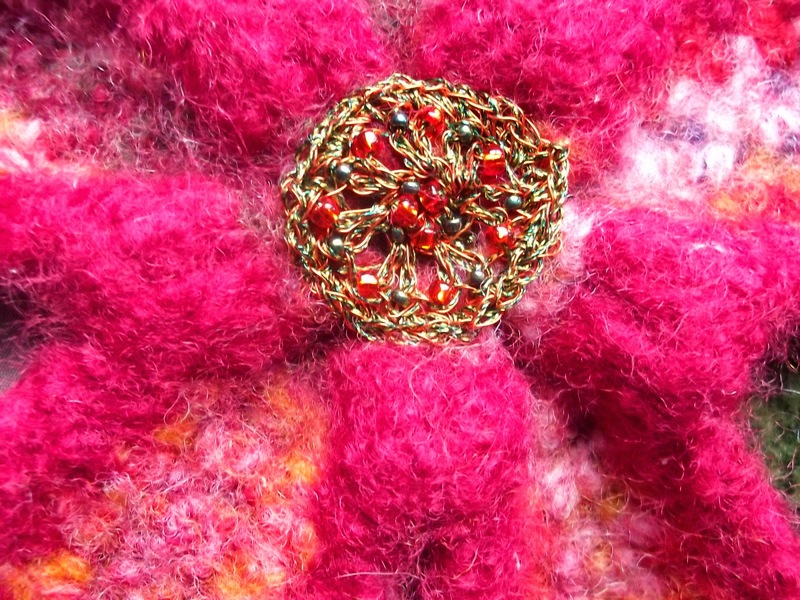 Again, the center on this one was crocheted with the Argh! 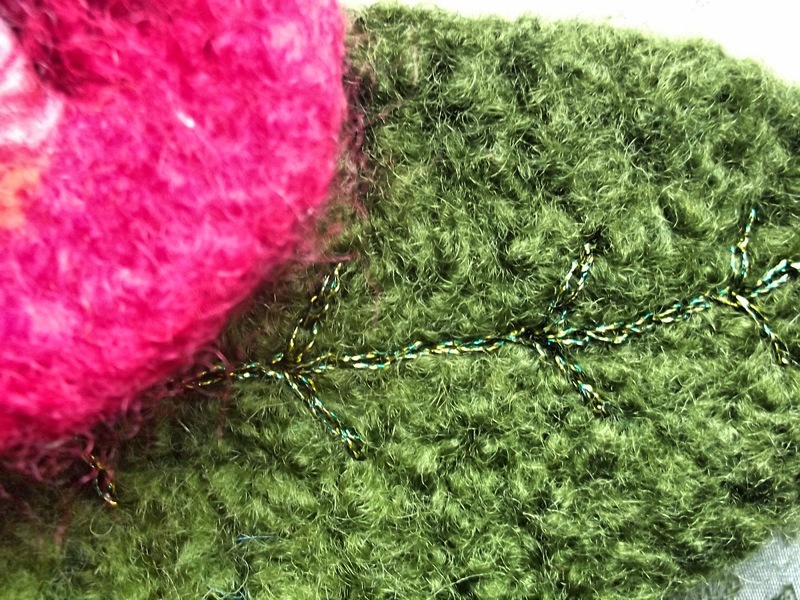 thread and permanently-colored copper wire. 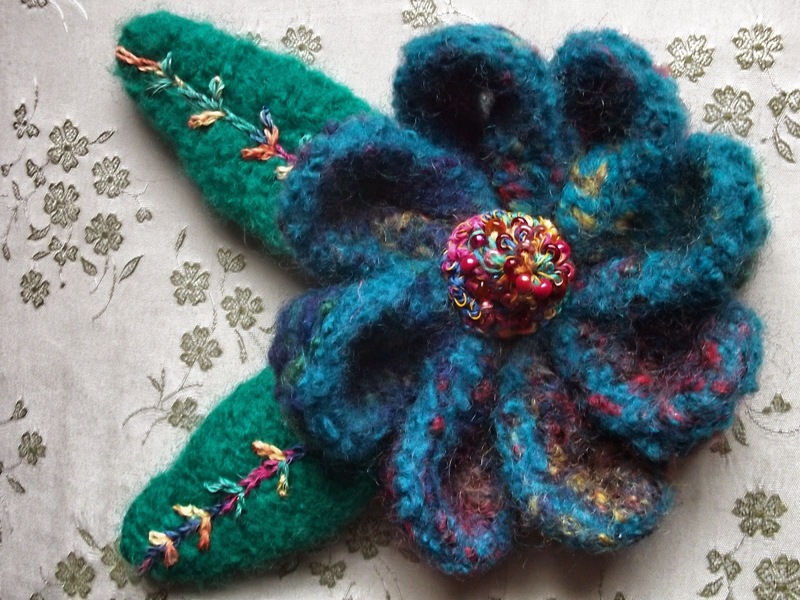 Since the leaves are felted, they had sufficient sturdiness that no wire was needed. 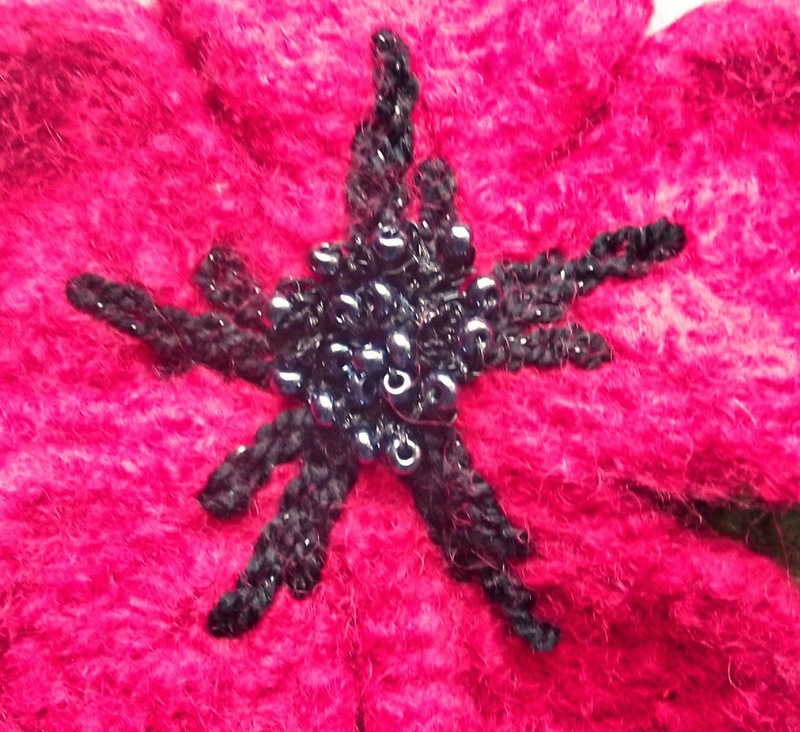 This one I call "Poppy Love". 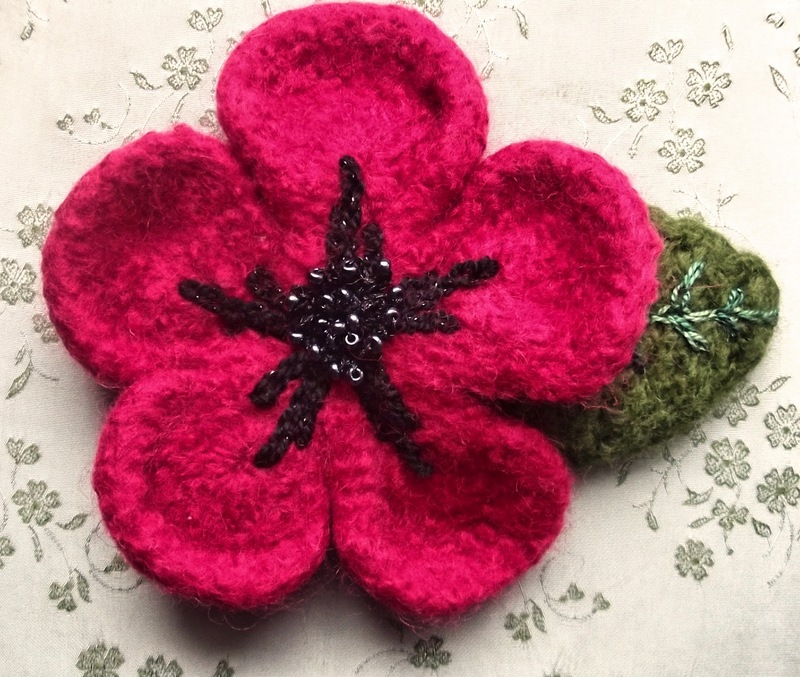 It's doesn't look quite like a true poppy, but with these colors, the name still fits. This red-toned beauty is big and bold! The flower alone is over five inches in diameter. 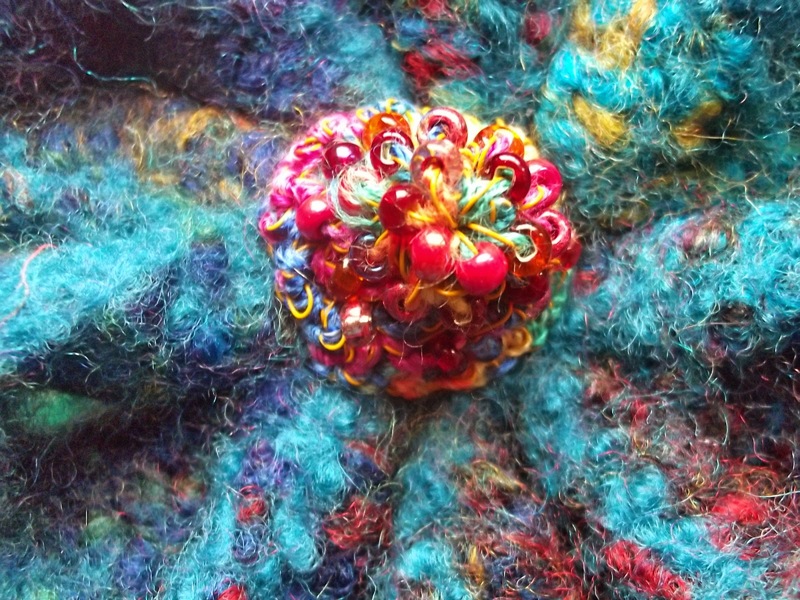 The photos above show how I put together the backs of these felted flower brooches. 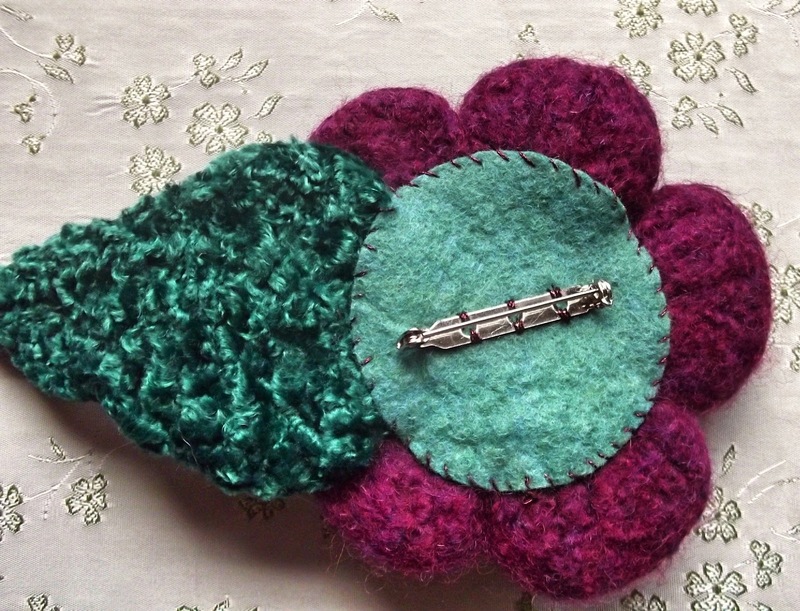 I used 100% wool felt and hand sewed my pieces together. As a little postscript, I thought I'd share my "Sea Goddess" pin. 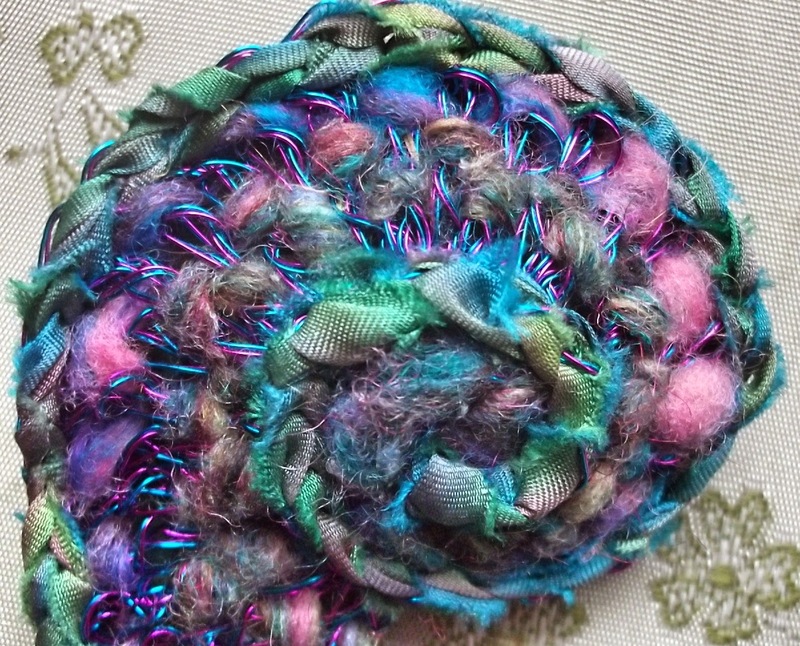 Based on the concept of the nautilus shell, it was crocheted using permanently-colored copper wire. 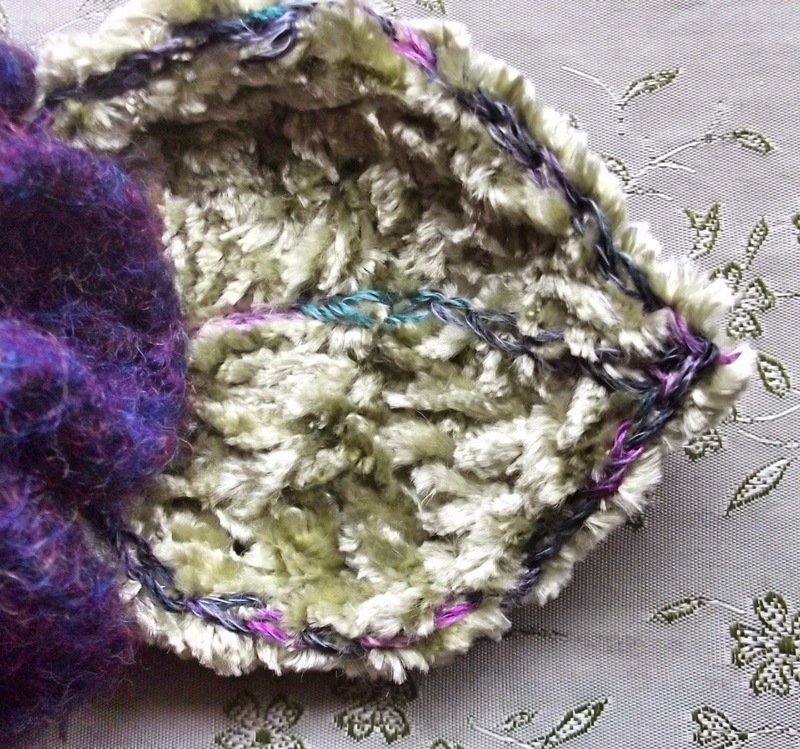 Slip-stitched details were added using hand-dyed silk ribbon, and then hand-dyed wool yarn was woven through the shell. 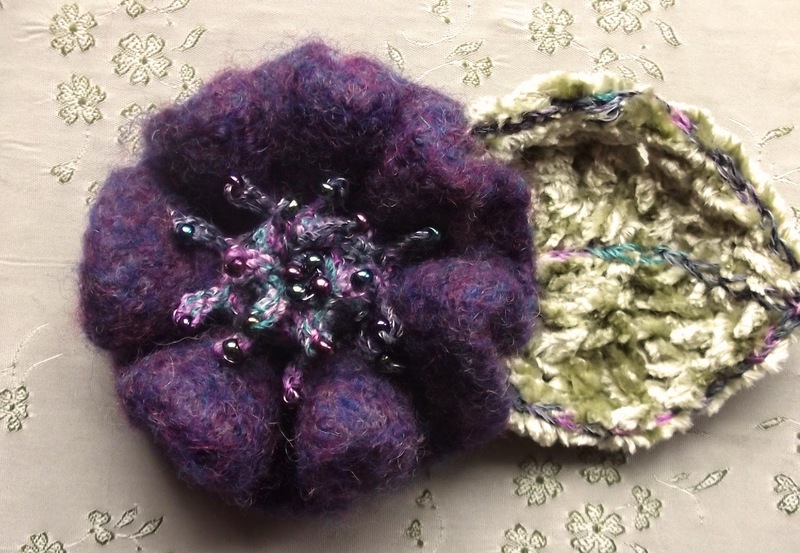 Flower aren't the only summer item that can be "cozified" for winter!